"Unhappiness is our own invention." So is this the greatest film with a woman as its central character? I'm always suspicious of superlatives, and a movie as fine as this one is done a disservice by a doctrinaire ideological reading (though the academics on the commentary track clearly disagree with me—see below), but a quick glance at your standard Greatest Films Of All Time list looks awfully like a boys' club. (Take your pick: Citizen Kane, The Godfather, Seven Samurai—even Vertigo and 8 1/2 are fiercely locked in to a male perspective.) 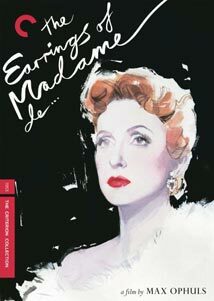 Gender politics aside, The Earrings of Madame de, director Max Ophuls's penultimate picture, is in many respects the perfect capstone to a stellar career. His restless though smooth camera work, his reveling in a bygone time, and his heartfelt empathy with his characters' emotions, even if they may be shallow, may be unequaled—and it's just sort of a bonus, almost, that this is kind of a great big soap opera of a motion picture. Ophuls's film is based on a short novel by Louise de Vilmorin, and one of the conceits of the piece is that we never learn the surname of the central character (or, obviously, that of her husband). It sometimes seems like a bit of a precious annoyance, but overlook it—everything else here is quite lovely. Madame is married to a General, and lives a late-nineteenth century life of bourgeois leisure—the movie opens with the camera panning rhapsodically over her oodles of furs and jewels and dresses and hats, though for reasons not entirely made clear, she's hard up for cash, and trying to decide what to hock. She settles on a smashing pair of diamond earrings, a wedding present from her husband, and most distinctive—she dummies up a story about losing them at the opera, but she's a bad liar, and her husband is onto her in a hurry. This isn't, of course, a movie about jewelry. Rather, Madame is a tragic heroine of her period, part of a lineage that extends to Emma Bovary and Anna Karenina, and she's got her American analogues as well, most notably in the works of Edith Wharton. (This film was obviously a huge influence, for instance, on Scorsese's The Age of Innocence.) All the blood has drained out of her marriage, and her heart is taken with another: Vittorio de Sica plays Baron Donati, Madame's dashing new paramour who travels in the same circles as her husband. The General is played by Charles Boyer, whose grand, inquisitive eyebrows are as impressive as his epic epaulets—this is not a man one wishes to wrong, especially with all the firearms at his disposal. Madame is played by Danielle Darrieux, and in many respects it's a very odd part—her passions are deeply felt, but strike us frequently as contemptibly shallow, so at times she's like Camille, and at others like Daisy Buchanan. There may not be much to her, but you can't help but have sympathy for someone so reined in by social circumstances—it's a similar reaction you may have to, say, Miss Julie, or Nora in A Doll House. But what's never in doubt is Ophuls's fierce control over his material. His camera glides, never quite judging Madame and her coterie; we're allowed to participate in her boudoir dramatics, but you also sense a bit of a sneer coming in our direction, almost challenging us not to be hypnotized by the luxury of the world being depicted, asking us if we too are in fact as superficial as Madame. And at times you simply cannot believe the technical accomplishments of the movie—routinely, for instance, Ophuls will frame his characters below a mirror, allowing us to see the activity in the rest of the ballroom, maintaining both the intimacy of a private conversation and the spectacle of a first-tier ball. It's a marvel of a film, and holds up under the weight of all the superlatives that have been heaped upon it. Image Transfer Review: The other two contemporaneous Criterion Ophuls releases (La ronde and Le plaisir) pale in comparison to this one, in technical terms—the lushness of this transfer is simply intoxicating. It's hard to think of a black-and-white film of its period (or any other period, probably) that has looked any better on DVD. C'est formidable! Audio Transfer Review: I won't get as madly fanboy over the sound as the picture—the mono track here is certainly perfectly fine, though the music can sometimes sound a little reedy. Extras Review: As alluded to above, the commentary track, by Susan White and Gaylyn Studlar, reflects the scholars' intimate knowledge of this film, and of the body of Ophuls's work, but it can still be a little trying. They're not much interested in filmmaking technique, it seems, though they allude to Andrew Sarris calling this the most perfect film ever made; instead, we get more of an anthropological and sociological approach to the picture. Which can be fine, except that this frequently becomes overly reductive—for instance, we're favored with a Freudian reading of the film in which the earrings become a missing phallic symbol. Check, please. Paul Thomas Anderson provides an introduction (14m:28s), though you'll probably want to watch it after the film, not before—it's an audio track over some of the more impressive tracking shots in the picture, with Anderson marveling over and explicating some of Ophuls's technique. (One can't help but ponder how a hypothetical meeting between contemporaries Madame and Daniel Plainview might go.) Grouped on the heading Ophuls's Collaborators are a trio of interviews: first, with assistant director Alain Jessua (25m:27s), shot in 2005, in which Ophuls comes across as a Jekyll-and-Hyde sort, an angel off the set, a monster on it. Co-writer Annette Wademant, in a 1989 piece (6m:50s), describes being the decidedly junior partner in this collaboration, and assistant decorator Marc Frédérix (8m:11s) proudly shows off the few surviving drawings from the film's pre-production phase. A visual essay (17m:19s), by scholar Tag Gallagher, provide a shot-by-shot exegesis of a few crucial sequences, with an emphasis on Ophuls's editing style, and references to the director's other films and most pronounced literary influences, Stendhal chief among them. And in a 1965 interview (4m:43s) for French television, novelist Louise de Vilmorin discusses Ophuls's adaptation of her work, and expounds on the nature of love. You can read Mme. Vilmorin's original in the accompanying booklet, which also features a rapturous essay on the film by Molly Haskell, and excerpts from a memoir on the picture's production from costume designer Georges Annenkov. Perhaps Max Ophuls's crowning achievement, and simply a motion picture of the highest caliber. The transfer on this DVD is especially delectable, and the whole package is most highly recommended.